Welcome to Corona Coatings Corp. Welcome to Corona Coatings Corp., Apple Valley's best value in exceptional quality spray polyurethane foam roofing, wall insulation, and storage tank insulation systems since 1976. During our over 35 years in business, we have expertly installed our spray foam roofing and insulation systems for thousands of satisfied Inland Empire residential and commercial customers, and have earned a reputation for providing both excellent customer service and the latest in cutting-edge foam roofing and foam insulation technology for homes and businesses throughout our service area. At Corona Coatings Corp., our knowledgeable foam roofing and insulation professionals are committed to educating the homeowners, business owners, and construction industry professionals we serve concerning the many benefits of the polyurethane spray foam products we install, and about how these products can help to insulate their buildings and equipment, as well as promote energy conservation. Corona Coatings Corp. is an authorized contractor for both the Henry Company and NCFI Polyurethanes, and proudly installs their spray polyurethane foam roofing and insulation products for our valued Apple Valley clients. Our skilled foam insulation technicians have years of experience in the field, having on average from 12 to 14 years experience working in the polyurethane foam roofing and insulation industry. In addition, all of our technicians are required to adhere to a rigorous schedule of ongoing training in the use and application of the high-performance, long-lasting polyurethane foam roofing and foam insulation systems we apply. Corona Coatings Corp. holds both a C-39 Roofing Contractor's license as well as a C-2 Insulation Contractor's license, and is a proud member of the Better Business Bureau (BBB) and the Spray Foam Insulation Alliance (SFIA). Call us today for a free onsite estimate at your Apple Valley home or business. Since 1976, Corona Coatings Corp. has provided our expert spray foam roofing, wall insulation, tank coating, and roof maintenance, inspection, and certification services for Apple Valley businesses. 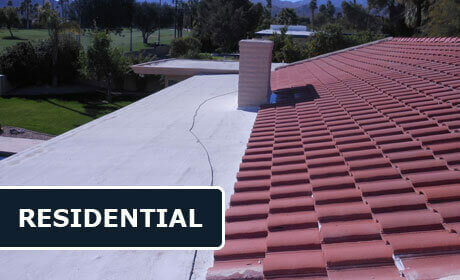 At Corona Coatings Corp., our experienced roofing professionals can install our durable, lightweight spray polyurethane roofing system directly over your existing roof system, precluding the need for the costly, time-consuming, and disruptive tear-off of your old roofing system, and providing your business with a brand new roof within a matter of days. 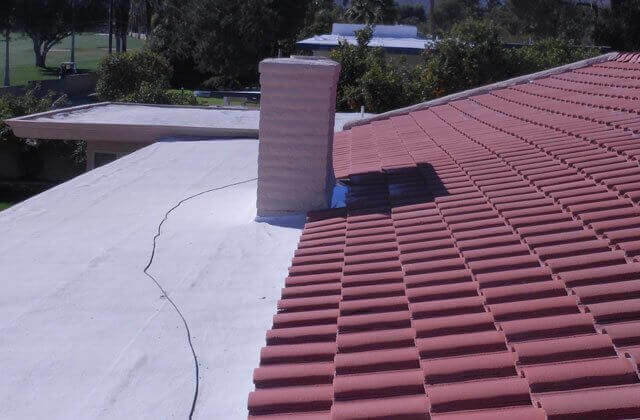 For decades, Corona Coatings Corp. has installed spray foam roofing and wall insulation systems throughout the Inland Empire. Spray polyurethane foam roofing and wall insulation systems provide superior thermal performance over traditional insulation systems, and are simply the highest quality insulation systems available for maximal home comfort. And not only does spray polyurethane roof and wall insulating foam keep your home warm in the winter, and cool in the summer, but it also creates a protective environmental envelope around your Apple Valley home, protecting your family from the infiltration of dust, pollutants, pollen, and also providing an effective barrier against outside noise. 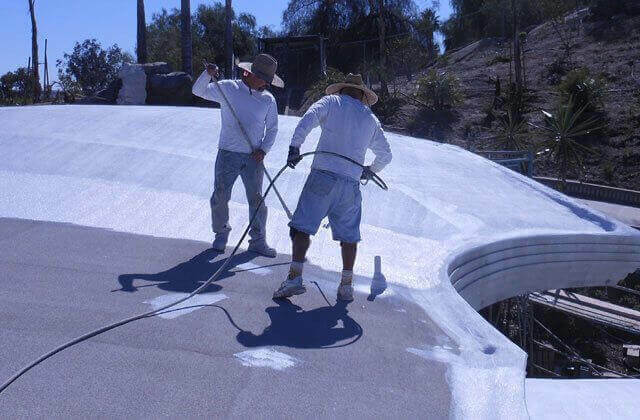 Spray polyurethane roofing systems (SPRS) are the ideal roofing solution for both new and existing Apple Valley flat-roof residential and commercial structures. They provide an extremely lightweight but durable roofing system which is highly energy efficient and virtually leakproof. Conventional single-ply asphalt-based roofing systems feature thousands of feet of seams and puncture points where mechanical fasteners have been used to attach the roofing material to the rooftop, creating prime areas for leaks to form over time. 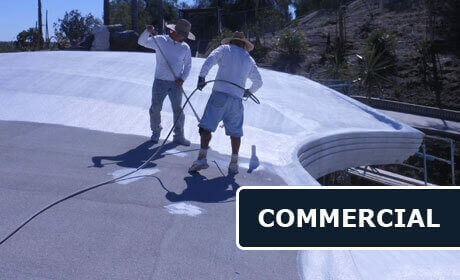 In contrast, foam roofing systems are completely seamless, and require no mechanical fasteners. When a leak occurs in a built-up or single ply roof, water may travel some distance between plies before it enters the building, making it difficult to locate the source of the leak. In addition, rock, finishing or ballast may further hide the source. In contrast, water cannot travel laterally through spray polyurethane roofing systems, so leaks are easily located and can be repaired easily by the reapplication of additional SPRS product. Moreover, spray foam roofs are also self-flashing, forming a continuous, waterproof barrier over rooftops which tightly seals itself around all ductwork and other roof penetrations, resulting in the most impermeable roofing system available today. At Corona Coatings Corp., we have expertly installed our energy efficient spray foam wall insulation in Apple Valley since 1976. The insulating properties of closed cell polyurethane foam are far superior to those of standard fiberglass batt and cellulose insulation. Spray foam insulation possesses a greater R-Value per inch of thickness, offering greater thermal performance, and is more resistant to moisture and mold. In addition, it has greater sound-dampening properties, and is better at reducing sound transmission through interior and exterior walls, promoting a tranquil home or business interior. Insulation is an important Apple Valley architectural design feature, because it has such a large impact on regulating a home's or business's internal temperature, affecting the comfort of those inside. The quality of insulation in a structure also has a significant effect on the energy output required to heat and cool a building, and can greatly influence heating and cooling costs. At Corona Coatings Corp., we also apply our durable polyurethane spray foam insulation to Apple Valley residential and commercial storage tanks of all types, including water tanks, grease traps, chemical tanks, fuel tanks, wine tanks, and solar tanks. We can insulate both heated and cold storage tanks, enabling these containment devices to maintain the optimal temperature required for storage, maximizing their energy efficiency and saving our clients money on their utility bills. At Corona Coatings Corp., we have provided our tank insulation services to businesses and municipalities throughout the Inland Empire, and have performed tank insulation projects for restaurants, hotels, wineries, industrial clients, and also the City of Riverside. Proper maintenance is vital to the life expectancy of your Apple Valley home or business polyurethane spray foam roof. At Corona Coatings Corp., we offer an annual routine maintenance service, during which our roofing professionals will come to your home or business, clean all debris from your foam roof, evaluate the integrity of your foam roofing system, and perform repairs as needed. In addition, our foam roofing experts can also perform official foam roofing system certifications, required by real estate law on all commercial and residential properties possessing a foam roofing system prior to sale. Choose the industry leader. Discover how our superior polyurethane spray foam insulation products can enhance the comfort of your Apple Valley home or business. Call Us Today. We offer free onsite estimates.